In 1993 John Moffat became concerned about the risk to his family’s graves and founded the Friends of Flaybrick with the support of the Birkenhead History Society. The society now has a membership of over 60 members with the Right Honourable Frank Field as patron and Professor John Tarn OBE as president.. Two years later, In 1995, we succeeded in getting the name of the cemetery changed from Flaybrick Hill Cemetery to Flaybrick Memorial Gardens. During 2004 the Friend’s secured Flaybrick’s status as a Significant Cemetery in Europe and in 2010 it became part of the European Cemeteries Route. This was largely achieved because of Kemp’s landscaping. In 2011 Flaybrick was added to the National Heritage at Risk Register, which lists all heritage sites which are venerable and in danger. The Friends continued to campaign for the future of Flaybrick and in 2016 a joint funded project, between Wirral Borough Council and Historic England, earmarked £325,000 for work to be carried out to stabilize the chapel walls to prevent further collapse, and to preserve existing stonework and carvings which lay hidden for over 30 years. 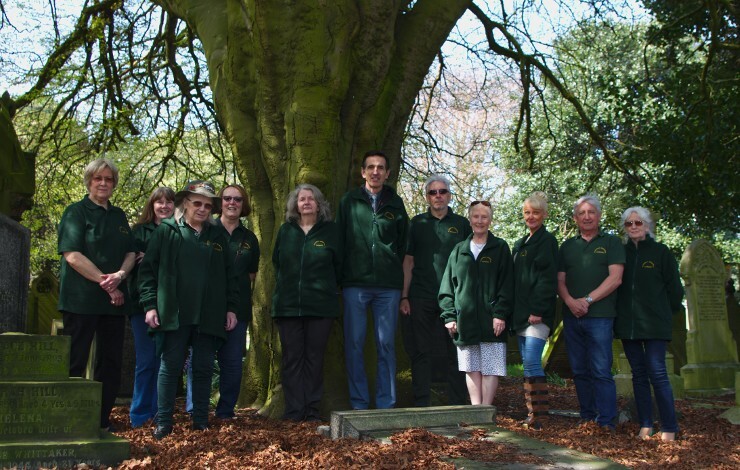 Because Flaybrick is, ‘buried up’, there is a need to develop new uses for the landscape and as part of our future plans we are developing an arboretum with the aim of explaining the important role that trees play in our lives. In addition to the above key projects we have a group of regular volunteers who work on site to help clear Flaybrick of litter and excessive vegetation. Historic England and Wirral Borough Council are now working with the Friends of Flaybrick and the local community to create a Conservation Management Plan that aims to preserve Flaybrick for the future. If you would like to help in any way, please become a member of Friends of Flaybrick. Membership is easy, all you have to do is support the objectives of the ‘Friends’ and renew your subscription each year. There are no other obligations, unless you wish to take a more active role by joining our team of volunteers. The subscription is £7.00 per annum (£3.50 if unwaged) which is due on 1st January each year. We hold 4 meetings a year to keep members up to date. If you would like to join the Friends of Flaybrick please get in touch using one of the methods on our Contact Us page.